A man of many names: lil Wayne, Weezy F. Baby, Birdman Jr. or just Wayne (if you're nasty), dropped (on iTunes) his latest jaunt into the hip-hop solar system on his 27th birthday (from prison) this past September. The title track 'I Am Not A Human Being' happens to be FYM's Jam of the Day this week. 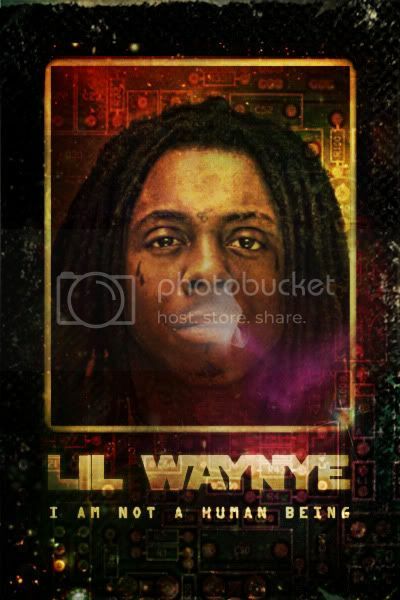 The video above features an alien-eyed neon drippin' "greatest rapper of all time" Wayne, blending his untouchable (in today's game) hip-hop lyricism, with crunching 808 guitar samples, amicable to sounds of 80's hip-hop past. I Am Not A Human Being, Wayne's 8th studio album comes during a time as he paces in a state of solitary confinement (during his 9th stint in prison) at Rikers Island. The album itself seems to be lacking the depth of 2008 masterpiece Carter 3, but it's still better than anything else released in hip-hop this 2010. Drake also makes several cameos on this album, contributing more here, than he did on his own release this year (which we are still not thanking him for). Weezy is scheduled to be let out of prison this November, where an unparalleled celebration of freedom, weed, and prescription cough syrup will be on display in honor of his release.